I'm new to the forum.Great to be able to contribute. Paukvk and I purchased eight PIP-4048WM VERSIONS(2015). One(mine) has been on line for about 2 years just out of warranty.Paulvk for about same time. After calling GPower without much help was totally frustrated why main board could not be removed and was going to ask you? Quite amazingly as I was working on the same problem at the same time on the same day(Yesterday) as you!! Thanks soo much for the post because that is ONE sneaky screw under date code designation label!!! Have done visual -no dc checks of Mosphets but noticed one of 3300uF 65V electros closest to rear of inverter light brown colour slight leakage component side between pcb and cap crimp rim diam. Welcome Howard. Yes., that Coulomb is one coul doud. You're lucky you only got the sweet white smoke of Gandalf the capacitor and not the foul-smelling black smoke of Sauron the MOSFET. Coulomb and I recently did an exhaustive search of Digikey, Mouser, RS Components and Element14, looking for suitable upgraded capacitors with an 80 V or more rating. This time we allowed for capacitors up to 22 mm in diameter, as previously one could only fit 18 mm. But we did not find any new option with low enough ESR or impedance, and high enough ripple current. So our recommendation for the capacitors is exactly the same as it was 2 years ago. Here's the data sheet for the existing capacitors. I had to request this from the capacitor manufacturer. It seems it is a "special", i.e. not part of their standard line. Digikey part 565-4129-ND. Also available from other suppliers. Here's my post from 2 years ago, in which you can read more details about this choice, and the slight hit taken on impedance and ripple current in return for voltage and endurance. The existing MOSFETs are the 75 V IRFB3077. A few weeks ago I listed 5 potential choices for upgrading these MOSFETs to 100 V.
We've since settled on the SUP70040E. Digikey part SUP70040E-GE3-ND. May be available from other suppliers. 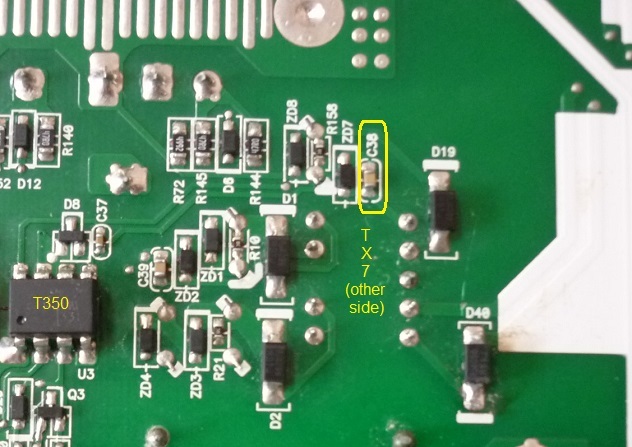 As with the capacitors, we've taken a slight hit on current ratings and on-resistance in return for the voltage rating, but the intention was that no spec should be significantly worse than that of the 75 V IRFB3307 used by the manufacturer two years ago. I note that each inverter uses 4 of the capacitors and 16 of the MOSFETs. You may choose to replace only the capacitors, but you should definitely replace all four at once, even if only one has failed. The others won't be far behind. And since it is such a pain to get the board out, you might consider upgrading the MOSFETs at the same time. Yesterday at my place, Coulomb pre-emptively upgraded the MOSFETs and capacitors in his PIP, to the above choices. I have just heard that he has reinstalled the PIP and it is working fine. But of course we cannot guarantee this upgrade. You do it at your own risk. Last edited by coulomb on Sun, 09 Jul 2017, 09:12, edited 1 time in total. Thanks for that and first message ...Yep will do .Plan to do all that.Concur on mosphets and overall view. We will need about 32 capacitors for all units.We were thinking about Nichicon for caps but have to check specs & bulk order? You guys using earth straps on wrists? Thanks again..no worries yes realize the risks. Hi Howard. We didn't bother with anti-static wrist straps because the humidity is so high here in Brisbane at the moment. Let's face it, it almost always is, except for a few weeks in winter. But they are a good idea. We looked at Nichicon capacitors. We did not find any 80 V (or higher) Nichicons in 22 mm (or less) diameter with radial leads, with a low enough high-frequency-impedance and a high enough ripple current, along with a 105°C endurance rating of 2000 hours or more. If you think you might have found one, please point us at it. I note that these are the important parameters in this application. The capacitance is utterly irrelevant. Will get to parallel mode yet. I wanted to ask Coulomb, information about the firmware "
The Latest Patched Firmware Description - dsp_Pb1_72.70b.zip "
I have three inverters, N°2 Mod PIP4048HS , and N°1 Mod ASK5000 Advance, do not use chargers inverter to charge the batteries, but use N°3 Western WRM30 mounted separately. I 24 batteries in free acid "Plante" from 2V, (so in total 48V) of handicraft construction, which allow a minimum voltage of 40V to release. And 'well it is known that the inverters currently use and which you know, unhooked the battery back in utility mode at 44V. I wanted to understand whether the modified firmware allowed to lower this threshold to 40V everything else as it is now okay to me. Thanks for your attention dedicated to me. It's not clear to me whether the patched firmware (or the original manufacturer's firmware that they are based on) is suitable for the PIP-4048HS models. These have a maximum of 50 A solar charging (as opposed to 60 A for the PIP-4048MS. There could well be other firmware changes, since the Solar Charge Controller is completely different (PWM versus MPPT). I strongly discourage use of the patched firmware on the PIP-4048HS models. If you do decide to try it, at minimum, you should have a way of going back to their original firmware, in case the patched firmware doesn't work, and somehow doesn't blow up the hardware. What firmware version came with the PIP-4048HS inverter? You seem to be saying that you have a very unusual lead-acid based battery that somehow is allowed to be discharged down to 1.67 V per 2.0 V nominal cell. I've never heard of such a battery, and everything I've read about lead acid batteries says that for longevity, one has to keep away from low terminal voltages. So if I understand you correctly, you'd like a custom version of the lead-acid patched firmware that allows setting 12 to go down to 40.0 V instead of 44.0 V, with all other features being the same as the existing lead-acid patched firmware. It's not obvious to me that it's safe for the inverter to operate at 40.0 VDC. The DC bus seems to operate at a fixed 8x the battery voltage, so when the battery voltage is at 40 VDC, the DC bus would be at 320 VDC, which is not enough to generate 230 VAC (230 x √2 = 325 V, plus MOSFET/IGBT voltage drops). So either it would generate less than 230 VAC, or it might attempt to generate 230 V with the tips of the sine wave clipped, causing poor power factor, possible electromagnetic interference, noise, and other problems. I don't think it's a good use of resources to develop and maintain a special version of the firmware for one or a very few users. I have to draw the line somewhere. Sorry. Coulomb Thanks for the answer, very polite. From some tests done, I saw that if I remove the 220V utility power while the drive is switched to "SBU", the inverter stays connected up to 40V before the change in "UTI" then trying to figure out if it was possible to activate this possibility inverter itself without the main switch, these batteries do not suffer from the problem on the voltage to 40V obviously I was advised to charge them within 24 hours. A presisazione, I do not use internal inverter chargers to charge the batteries but use separate chargers, then the input of the inverter panels are disconnected. In fact, the batteries which I am using as mentioned earlier is an artisan creation of an Italian boy, are decidedly robust batteries, in fact, both the positive plates and negative are in the lead with a thickness of 10mm and each battery weighs 70kg were formed with discharge School and refills without using any material paste on the plates, the oxides were formed only by the charging and discharging process. The main problem of these batteries is that I should get as charge equalization at least 62V, which do not allow my inverter ...... but that's another problem. Quick answer on Nichicon is no stock ..but can make volumes. We are investigating these capacitors that this was not an O/volt issue but an ESR,temperature,(yes aging too) as they are mounted right next to heatsink. It was as load ramped up to 82A from batteries inverting to 240VAC 4KW load that cap/s died.Have logged .pdf report if anyone is interested. Will keep you all posted. Thanks! After so much searching I did not find people as wise as here. I come to ask for your help to repair my PIP. When I changed a fan (with the problem already mentioned here) to another with the colors of the different wires, I shorted the wires and damaged the board. Sorry to hear you need to do that. Interesting. But the parts you mention below seem to be part of the IGBT power supply; I would not think of these as related. I was curious as to what that part of the circuit was doing. So I did a quick trace of it; see attached. Warning: I've probably left parts out of this partial schematic. Use your browser's controls (View Image, Open Image in New Tab, etc) to see the schematic in detail. The Zener voltages and part numbers are a bit of a guess, based on my reading of tiny marking codes, and other markings on the parts that could be the real marking codes. I think it's making a negative supply of about 5.6 V, and a positive supply of up to 18 V, relative to the IGBT emitter, and isolated from the source of power (I can't find where those wires go; it has low resistance so presumably it's another transformer winding). This circuit is repeated two more times. One of these power supplies runs three opto-coupled gate drivers; the other runs one. QB2 is one of the upper IGBTs of the 230 V inverter output full bridge. The RS1J diodes are moderately fast 600 V rectifiers, with a tᵣᵣ of 250 ns, made by Vishay. Other similarly fast rectifiers, with any decent voltage rating should do. These are SMA (DO-214AC) sized devices. Last edited by coulomb on Tue, 25 Jul 2017, 14:38, edited 1 time in total. Truka wrote: I also do not understand if the fan connectors sit low on the board, and the burned components are on the top. I think this could be a little mangled in the translation from Portuguese. I think you are remarking that the fan connectors are at one end of the main PCB, and these components are near the far end, so what could the connection be? I'm thinking that somehow the voltage to the transformer primary (at the right end of my partial trace schematic diagram) was too high. Maybe it was because the fans were shorted out, and it was trying to raise the voltage to the fans, and this raised the voltage to other parts of the circuit as well. Or maybe it was some sort of transient. Hopefully, the two zener diodes in series did their job, sacrificing themselves to protect other parts of the circuit. However, I'd check the other zener diodes and associated parts: ZD1,2, and ZD3,4. They are nearby; you can see them in the photo below. I can not find the capacitor C38. I don't understand how you know that C38 has failed, if you can't find it. Did you get these parts designators from some repair manual or similar? The T350 opto coupled gate driver is one of five in a group, but I assume you already know where these parts are, to give their designators. C24 is on the other side, with the 15k bleed resistor R158 across its leads. I'm surprised to hear that R158 is burned; its value is 15k; assuming it can dissipate 400 mW (total guess), it would need more than about 77 V to overload it. At that voltage, plenty of other components would burn up. Hopefully XD7 and ZD8 failed shorted, saving other components, but that would also include R158. Years ago I wrote a post about how to attach photos to posts; I can't find it now. Maybe it's time to write another one. Last edited by coulomb on Thu, 13 Apr 2017, 09:14, edited 1 time in total. nice to see some new post. Weber, trying to get a new module so my rs232 will work. Truka wrote: I mean, I did not see the C38 capacitor in your circuit. Oh! My bad. I copied a capacitor from another schematic, and it happened to be C11. I then forgot to change its designator to C38. It's the capacitor across ZD7. Sorry about that, corrected now. Last edited by coulomb on Wed, 19 Apr 2017, 04:58, edited 1 time in total. I have a strange situation with a PIP-4048.In the meniu 16 I set OSO(only solar charging)option.If I shut down the inverter from On-Off button and the AC grid is connected, after about 30 seconds the inverter try to start for few seconds: the LEDs and the display are lighting and after that is shutting down.The process is repeating continuously until I cut-of the AC in breaker. rinaldoparaipan wrote: I have a strange situation with a PIP-4048. What main firmware are you running on that inverter? When you say the LEDs are on before they go off, are they all on together for just a second or so, like at startup? Yes, the LEDs has the same behavior like at startup. Last edited by rinaldoparaipan on Fri, 21 Apr 2017, 14:16, edited 1 time in total. There it is. The definition for the real-time operating system Task Control Block structure. I have to say I was a little surprised to see that this was published in a scholarly presentation. Alas, I don't read Chinese, but the fact that source code seems to be always written in English means that there are chunks of readable code throughout. I've long wondered what the second and third fields were about. If anyone knows how to translate such pages (Google Translate translates the text around the PDF, but nothing inside the PDF), I'd appreciate a pointer, perhaps via Private Message. Last edited by coulomb on Mon, 24 Apr 2017, 10:00, edited 1 time in total. I want to buy LiFePO4 for my photovoltaic system but I need to know where to get a BMS for the cells and a remote monitoring device for the battery bank. I will buy the lithium cells from ev-power. At the moment I have 5 pcs PIP4048 in paralel which I haven't changed the firmware but I want to. Weber and I are preparing to do a MOSFET and capacitor upgrade to another PIP-4048MS. This one was manufactured in February 2017, and has different MOSFETs and capacitors to the ones we usually see. Wow. Could they have seen the light and upgraded to our recommended specifications, making such upgrades unnecessary from now on? The MOSFETs are Texas Instruments CSD19505KCS. This is nearly the same part number as one of our recommended MOSFETs, the CSD19535KCS. The main difference is the MOSFET rated voltage; they are using 80 V compared to our recommended 100 V. With the lower voltage, they get better on resistance (2.6 mΩ versus 3.1 mΩ), but earlier models used the IRFB3307, which are 5.0 mΩ). So they've gone from 75 V to 80 V MOSFETs. This is probably adequate if the layout in the battery side of the inverter is exceptionally low inductance, but I don't believe that this is the case. There are actually two different brands of 48 V bus capacitor installed in this particular inverter. One pair is Jamicon TK series 3300 μF 80 V capacitors. The 80 V is another improvement, in line with our recommendations. However, the TK series is "general purpose", though with 105°C rating. The rated life is only 2000 hours, compared to 10 000 hours for our recommended part. It also has a low ripple rating, around 2 A [ edit: at 120 Hz; see below ] (it's hard to find real data on this part; it may be a custom manufactured part). The original capacitors were rated at 4.57 A, so they've gone backwards in ripple current rating. It seems to me that in this application, ripple current rating is important, so again, their upgrades don't seem to have gone far enough. The other pair of capacitors is Jainghai CD294 series 2200 μF 80 V. Again, the voltage is good, but the life (2000 h) and ripple current rating (2.1 A [ edit: at 120 Hz, see below ]) are poor. The CD294 doesn't seem to be a high ripple current series. The capacitance value (μF) is irrelevant in this application. So the capacitors have improved in voltage rating, but worsened in ripple current rating. I don't know if this is overall an improvement or not. In summary, the improvements are basically welcome, but in our opinion don't go far enough. Still, it will be interesting to see if and how much the reliability improves with the 80 V MOSFETs and capacitors. Last edited by coulomb on Sat, 03 Jun 2017, 06:27, edited 1 time in total. Thanks in advance, this can't be possible without your help. Yes, the patched firmware has some unfortunate naming that doesn't reflect the realistic chance that someone, such as yourself, might use a non-LiFePO₄ but still lithium based battery. At least we've started calling the one with the extended voltage ranges the LiFePO₄ patch (it was the "lithium" patch). To answer your question, basically only use the LiFePO₄ version of the patch if you actually have a LiFePO₄ battery. Yours appear to be 14s of a non-LiFePO₄ lithium chemistry, so you should use the so-called lead-acid version. You will be restricted, as with lead acid, to a maximum low-voltage cutoff of 48.0 V, which is some 3.43 volts per cell. I don't know your cells, but a quick search indicates that about 3.3 VPC is a reasonable figure. If you are indeed running 14s, you could use 46.2 V for setting 29, "Low DC cut-off voltage". You still have a little leeway if you want to increase that cut-off voltage. The U1 display (DSP firmware version) will become Pb1, where Pb is the chemical symbol for lead. Just ignore that. We'll fix it as soon as we figure out how to capture "non-LiFePO₄" in two letters Maybe we'll settle on Fe (for LiFePO₄) and "St" (for standard battery voltage range). It's not helped by the fact that people are starting to use the term "lithium ion" to mean "non-LiFePO₄ lithium based" (as I believe you did, joaquinsfy). LiFePO₄ (Lithium Iron Phosphate) is in fact one of the many chemistries under the "lithium ion" umbrella. Last edited by coulomb on Tue, 25 Apr 2017, 16:16, edited 1 time in total. Hi joaquinsfy, You need to install the Pb version. Your installation is lithium ion, not lithium iron. They sound the same, but they are very different things. The spelling matters.